Brand building isn’t advertising. It’s actually marketing. Advertising only puts you out there. Marketing is what people see when they find you. Your brand is what people will remember about you. First, every business we sign up HAS to have a BRAND. Most only have a logo, but building a brand is more than a cheesy logo. If a client already has a logo, it has to be digitized or it will appear pixelated and blurry. Business cards, signs, vehicle wraps, website and anything tied to that company has to match and be consistent. This includes a Google mail, analytics and voice account, so we can manage everything for you. You are kept in control of your own ship. In some cases we may have to claim or retrieve your Google Business page. Often times the client either had no knowledge that it was claimed by someone else or didn’t know where to even begin. Your Google business page is a very important tool you will need, and if there are pending issues, I will claim it for you myself. Google Analytics will show what’s happening on EACH page of your website. So, you KNOW what’s working and what to tweak. Google Voice will show the number of calls made THROUGH your campaign, and the actual phone numbers (time and date stamped). So, you can SEE the effectiveness of your campaign and track its success. We will take photos to use for your campaign as well as purchase stock photos if needed to make your brand look professional and powerful. We will set up a YouTube account and manage it for you. If you want to add your own videos or have us make more, we will manage them and post them for you. The use of videos has more impact than just pictures alone. Videos can also be optimized to show in the search engines and can increase traffic. A Video Commercial is a great way to kick off your branding campaign. We do the first one as part of the professional package, but you can buy more if you want to do more. You can’t have too many videos. In fact, the more the better. Testimonials are only powerful if people buy into them. Having testimony on your website is good, but people KNOW that YOU are in FULL CONTROL of your website. We link your online reviews directly to your website from trusted sources like Google, Facebook, Trip Advisor, Yelp, etc. We also include a Testimonial Video with your professional package. All of this is done on a WordPress platform. WordPress is a dynamic website that is user friendly and search engine friendly. This is the last website you will ever need for your small business. WordPress is always being kept up to date and most of the themes included are mobile friendly. Which means that people using mobile devices such as phones and tablets are going to have a great experience on your site. Custom Themes or Apps are also available (ask us for an estimate). As we are building your brand, establishing your credibility becomes a key element in the process. Everyone understands the value and importance of Word of Mouth. Some people think it’s their best advertising, it’s NOT. Word of Mouth is actually marketing …and the MOST powerful kind. Today, it’s in the form of REVIEWS and RATINGS on trusted sites like Google, Facebook, Trip Advisor, Yelp, etc. Some businesses don’t even know they have reviews, where they have them or even how to respond to them. Brand building requires credibility. Establishing your Credibility is crucial if you want to survive in business. Since the internet isn’t going away, and most of your potential customers are using the CURRENT standards…its time to appreciate your reputation online. 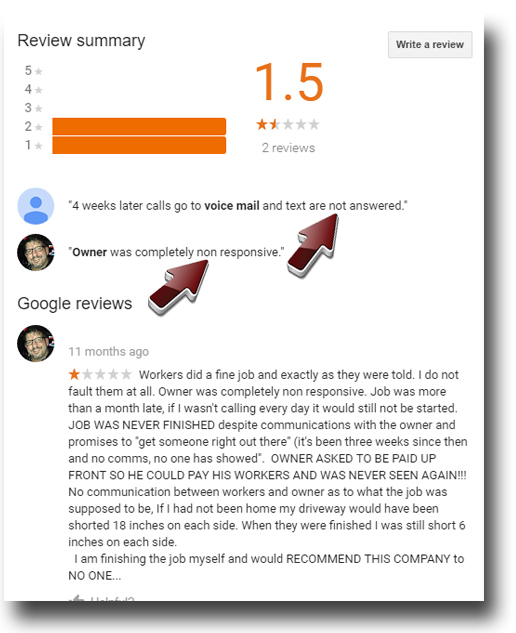 Anyone can leave a review, and getting them removed is very hard, time consuming and expensive. A professional response from you to a negative review sends a positive message to a potential customer reading it. Non-responsiveness sends a message that you are either not a legitimate business, or you just don’t care about your customers or your business. As you can see in the image below, customers do share their experience with others. This is modern day word of mouth…with a lot of broken teeth. Your best quality customers read these. If you aren’t monitoring your reviews, someone needs to be. If you just don’t have the time, let us know. This is what we do. We keep track of your reviews and notify you when you get one. We also help you form a professional response and post it for you. Timeliness is also important, so you need to be proactive with reviews. Blog Articles establish authority within your industry. Here is where YOU get to be the EXPERT. It’s one thing to have the knowledge and experience of being a professional in your industry…SHARE that knowledge with the potential MILLIONS that are seeking it, and you become the expert! We include 2 articles per month to be posted to your website. You are the experts in your area, we are the experts in ours. Together, we will make you look like the leader in your industry. Pictures help paint a powerful message and placed in just the right spots, will have a real impact on those reading your articles. We provide stock photos that we will purchase for these articles (included) or send us yours to post for you. Videos can also be used on these blog pages to further drive your point. You can use your own or we can find something relevant on YouTube to post for you. Our goal is to help you establish your own brand and build a powerful web presence online. Advertising ONLY works if you have something of interest to offer… WE MAKE YOU INTERESTING. 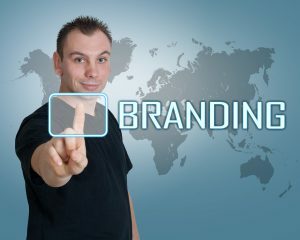 Dynamic Web Branding is NOT just an advertising agency. Once you are established and ready to move forward, our focus then becomes maximum exposure. Advertising online can add up and get expensive. Monthly budgets can be consumed in days, so strategic marketing must be done to maximize your ROI. As we are building your credibility, you will place better organically in local searches on all search engines. Google is still the leader. So, doing well there means will also do well in the others. There is no secret to ranking well. If you build a solid foundation and then build something of quality on that, you become desirable. Through a process of Search Engine Optimization and Website Optimization, your brand starts to gain organic exposure. This means that you’re not paying to be listed in these high exposure/ high traffic areas on the search engine. In fact, you can’t buy them! Your website is chosen through a complex algorithm that changes randomly looking for certain criteria. If you want your website to perform, just having one isn’t enough. A website is your marketing vehicle. Like a car, it doesn’t perform when it’s parked. You have to get in it, drive it and STEER it. Most cars on the road today are up to date and road worthy… your website also needs to be. Sales Funnels allow your website to do the selling for you. We will help you find your target market and build special landing pages on your site that will funnel leads into sales. You can use Link Bait material to draw prospective customers into your sales funnel system.